One of the most often asked questions in our house is "What's for dinner?" Before our daughter came along that question was (no matter how it was answered) usually met with satisfaction from our much easier to please older son. However, not only has our daughter (otherwise known as Miss Fussy) made me answer that question with trepidation most nights, our one time easy to please son is now exasperating us with his increasingly discerning tastes too. When you love to cook, as I do, it is most disheartening to announce what is for dinner and receive a less than enthusiastic response. That is why this recipe saves me every time. When I announce that we are having corned beef for dinner, the resounding response is YUM!!!!!! I think it is most appropriate that I am entering this post in the competition for NZ's best food blogger given that the prize is to see Rick Stein cook and speak in Wellington in August. It was indeed Mr Stein who helped me to rediscover cooking this fabulously simple yet tasty and comforting dish. And it was his method that made me think I could adapt it further to get as much mileage out of it as possible. My husband and I have always loved watching Rick Stein and in particular his Food Heroes series got me switched onto the merits of eating as locally as possible from sustainable food sources. It has long been on our wish list to visit his restaurant in Cornwall, but since Glen's diagnosis last year with terminal brain cancer, travel is off the agenda. So we figured that Rick coming to NZ was an opportunity for us to satisfy our dream in a more achievable way! I can remember corned beef as being a staple family meal while growing up. However, the newer methods of making corned beef (or corning it) seemed to take the flavour and texture out of it to the extent that I had given up trying to make it in the conventional method -that is, boiling it in a pot with cloves, onions, bay leaf, vinegar and golden syrup. No matter how many times I tried it seemed dry, tough and tasteless. 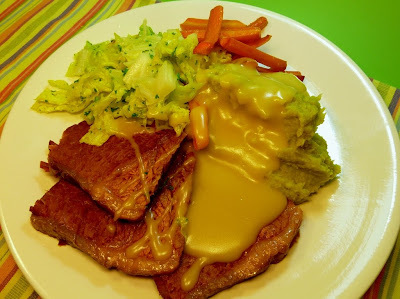 A happy coincidence a few years ago occurred however when I discovered what a slow cooker can do to transform corned beef into a tender, meltingly tasty meal. That combined with watching Rick Stein cook corned beef on one of his Food Heroes shows had me determined to give it another go. So, how glad am I of that happy coincidence???? Flipping over the moon!!! This meal never fails to please and it is eaten with regularity over the winter months. This version however is one that intrigued me as soon as I saw it. It reminded me of the Nigella recipe where she boils ham in cola, which to be frank I could never get my head around despite those who have tried it expounding it's great taste. It just appealed for the novelty factor so I really had to give it a go. 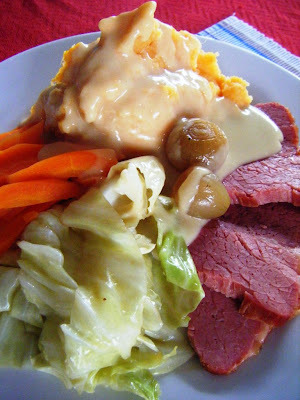 If you are more of a traditionalist, you can get the recipe from my previous post about corned beef. This is an Alison Holst recipe from her slow cooker book, which is such a fabulous book! The meat turned out really nice. I cooked it on high for about 5 hours and it was still fine. I did as she suggested with the sauce and it was beautiful. The flavour was subtle but different enough to the usual way I cook corned beef to want to make it again for something different. I added in about 8 pickling onions too, which I served along side the meat and they tasted fab. I didn't add the potatoes, rather I boiled some kumara with a few knobs of root ginger to make a yummy mash and served it with braised cabbage and carrots. A wonderfully hearty meal! Turn a medium to large slow cooker to Low. Rinse corned beef and place it in the cooker. Pour the ginger beer into the cooker to half cover the meat. Cut the orange into several slices (the cut skin gives extra flavour) and add to the slow cooker, along with the cinnamon stick, and the cloves. Add garlic (peeled and squashed with a flat bottomed glass bottle) to the cooker. Place the whole potatoes or potatoes in large pieces if you prefer around the corned beef. Cook on LOW for 8 hours or HIGH for 5 hours. Mash the potatoes or leave whole. Melt 25 g of butter in a pot with one tbsp of oil. Stir in 3 slightly rounded tbsp of flour over low heat, then add, 1/2 a cup at a time, 1 1/2 cups of the corned beef cooking liquid, stirring or whisking, and bringing to the boil after each addition. Linda, that looks so yummy. It's the time of year for a dinner like this and I love the thought of it being cooked in ginger beer. Hi... I'm your newest follower.